Suppressing my delusions of grandeur, I chose to review the less expensive Marano, rather than the sumptuous Elegance. The fact that I had only one day available for the review did have a bearing on my decision. The Elegance merits more time than a day. More like a week…or a month! 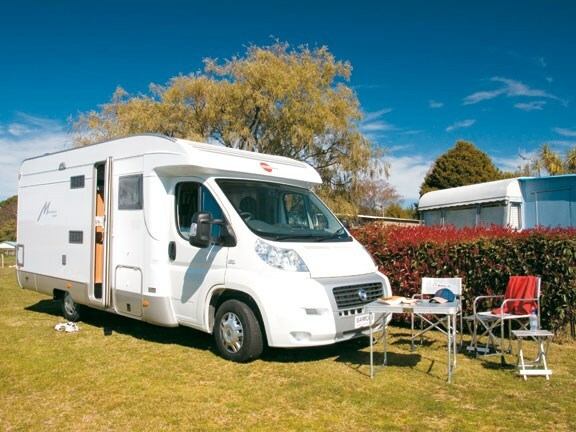 While Barrons RV in Taupo positions the Marano at the ‘entry-level’ in the Bürstner range, it markets the Marano range as a serious competitor against all-comers in the NZ market for permanent-bed, two-berth motorhomes. Calling the Marano a two-berth is catering to the self-indulgent. 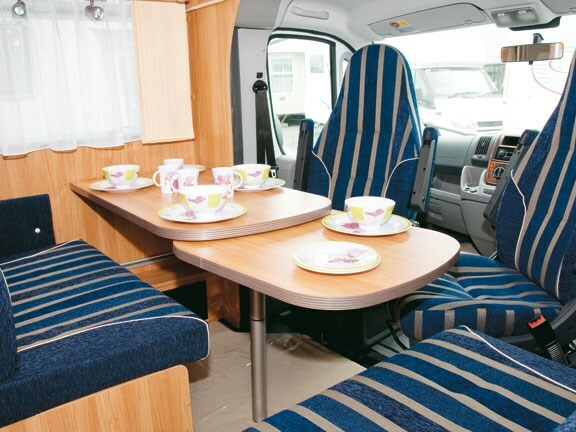 In fact, the dinette can be readily converted into another large single berth, or room enough for two small children. Note too that the dinette seats have seatbelts fitted for two passengers, so grandpa and grandma can have the grandkids stay the weekend! 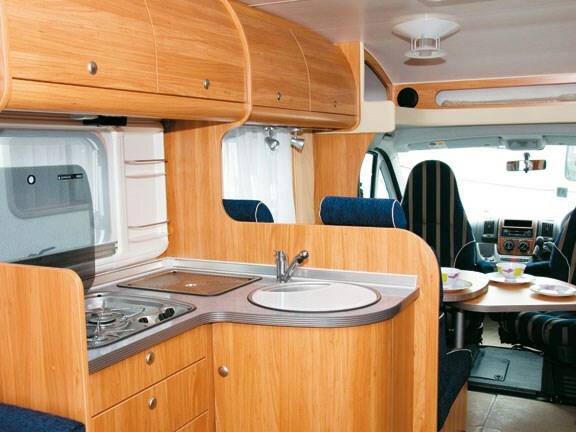 In the model reviewed, the dinette/lounge is at the front, adjacent to the cab. The cab floor is level with the lounge floor so that when the cab seats are rotated they can be used by diners at the table, or as comfortable lounge seats. Having the cab seats covered with same fabric as the settee cushions helps integrate them into the lounge area. The L-shaped kitchen is opposite the entry door, which reminds me – the entry door is on the driver’s side of the Marano. What we consider in New Zealand to be the ‘wrong side’ of the vehicle. I’ll come back to that. 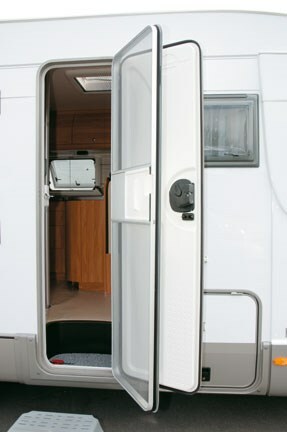 The permanent double bed is at the rear on the kerb-side, alongside the toilet/bathroom. The wardrobe unit and the fridge unit are opposite the kitchen, just aft of the entry door. This ‘European’ layout uses the space available efficiently to provide a comfortable permanent bed and a spacious bathroom area. The trade-off is that the kitchen bench is small and the entertainment area seats a comfortable maximum of five. Jill and I spent a day around Lake Taupo reviewing the Marano. We travelled just over 100km and hopped in and out of the vehicle a lot of times. The door on the wrong side was never an issue. When stopping on the roadside we exited the vehicle via the cab doors, as you do. When we pulled off the road into parks and lay-bys looking for photo opportunities, access through the ‘house door’ did not present us with any safety issues. After this experience, which was our first in using an RV with the house door on the ‘wrong side’, we would not be concerned about it in the future. Because the kitchen is small doesn’t mean it is not workable. Jill’s verdict was favourable. She said the drawers and cupboards were large and well proportioned so that everything she required in the course of meal preparation was conveniently located. She felt that with careful organisation, the kitchen area would be satisfactory. She hastened to add that she didn’t intend spending all her time in the kitchen and that I should do my own critique. I thought the covers over the hobs and the sink maximised the bench area, and I liked the separate built-in stainless-steel draining tray. The under-sink drawers and cupboard, the two large overhead lockers and the large drawer under the fridge would meet the needs of most couples. A larger fridge/freezer can be fitted, at the expense of sacrificing the drawer under the fridge. Above the fridge is a small Dometic griller/oven unit with a very smart curved reflective glass door. Allowing that, having a permanent bed in a motorhome 6.29 metres long is going to reduce the space available for other facilities. For us, the kitchen in this Marano is an effective compromise. We felt the same about the lounge area. 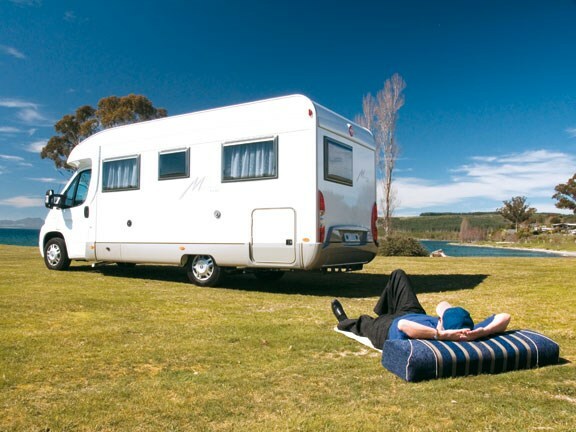 When we are away in our RV and ‘indoors’, we rarely entertain more than one other couple at a time, so the dining and lounge capacity is quite satisfactory for our needs. The dining table has a simple swing-out extension that provides generous table space for up to five diners. The seating is well-shaped and upholstered, with durable quality fabric covers. The panels and joinery are light elm timber with a golden brown satin finish that tones well with the curtains, and contrasts nicely with the predominantly dark blue-and-gold striped upholstery. The large central light fitting is augmented with three reading lights fixed under the overhead lockers. A large hatch above gives good ventilation and daytime light. With 1.95 metres headroom it should cater to all but the tallest of lineout forwards. The double bed has a sprung slat base under a pocket-sprung mattress and it is very comfortable. The mattress is in two parts and folds upwards, providing simple access to the large storage area below. This huge garage storage area can also be accessed through two external hatches, one on each side of the vehicle. Unfortunately bed layout failed my ‘sitting up in bed reading and enjoying a cup of tea’ test. There is not enough wall between the mattress and the window at the head of the bed to place your pillow against, and no shelf for the ‘cuppa’. I am sure there is a simple solution to that problem. Lighting and ventilation is well catered for with two windows and an overhead hatch as well as two reading lights. I liked the curtain that can be drawn around the bed to provide privacy. Next to the bed, behind a smart curved silver door is the bathroom. European RV manufacturers must have teams of designers tasked with conjuring up the most feature-filled, eye-catching bathrooms on the planet. This one is no exception. A grey moulded hand-basin, mounted on a curved cabinet with a corner mirror above it, greets you on entry. The one-piece white plastic moulding that serves as a shower tray has a plinth at each end for mounting the Thetford C200 series toilet and the hand-basin cabinet. A planked hardwood draining board provides an effective non-slip surface. To keep water off when showering two screens fold out, one in front of the hand-basin and one in front of the toilet. More than adequate space is created between the screens to conduct ablution activity without interference. The walls are clad with a grey patterned laminate. The ceiling is another one-piece plastic moulding with a 400 x 400 vent set into it. It is a stylish, practical bathroom. The cabinetry and hardware throughout the vehicle is excellent quality. 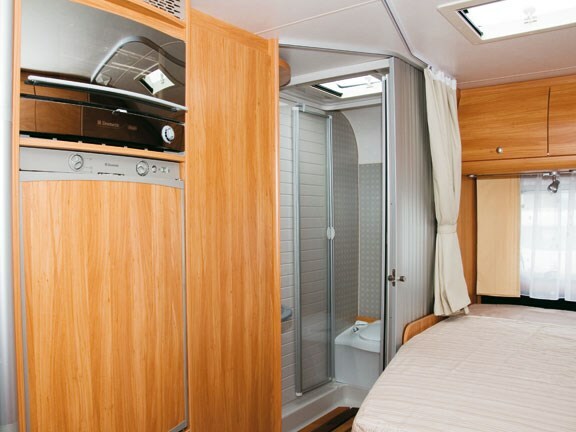 Creature comforts are catered to with double-glazing, blinds and insect screens on all windows, gas or 230-volt hot water heating, a three-way fridge, gas central heating, and privacy screens for the cab windows. Barrons RV add $2880 ORC to all motorhome retail prices, which at first glance may appear excessive. Closer scrutiny reveals the package is good value for money. It includes a three-year/100,000km mechanical warranty and a five-year coachwork warranty, registration, WOF/COF, an electrical WOF, 1000km of road tax, free first annual inspection, as well as NZMCA containment certification and a host of other benefits. The standard exterior finish of white panels and silver trim on the review model has proven popular overseas. The more adventurous may be tempted to try the flamenco or fire colour schemes, which add a rich rusty red in various patterns to the standard silver and white. This Marano is built on a Fiat Ducato standard chassis. It is powered by a four-cylinder 2.3 litre diesel turbo 130hp multijet engine with a six-speed manual gearbox. After a few minutes behind the wheel it is very easy to forget you are driving a large vehicle; easy, light handling, smooth gearshifts and firm braking. One of the selling features of this concept of motorhome is that it can be driven on a car licence and feels just like a car to drive. In the case of the Marano it is true in every respect. The Marano is in the price range asked for professionally fitted-out second-hand imported buses. It offers more than a match in quality and specification, can be driven on a car licence, and has extensive warranties to guard against malfunction. It will be a serious contender in the market place.